As promised, I have been in my kitchen baking away or preparing doughs for future baking. It has been much needed therapy for me. Jeffrey and I have still been quite busy running from one thing to the next, but we are beginning to see a light at the end of the tunnel. As we are beginning to think about our Christmas dinner and the “must have” goodies for the holiday season, I thought about this cookie. I first made this biscotti when Tyler was a newborn. I remembered enjoying the biscotti quite a bit so I knew I wanted to have it again this year. (I have a couple cookies/treats that are regular holiday items, but then I have an assortment of goodies that are rotated.) I think these are a great holiday treat because the dried cranberries and pistachios add just the right amount of holiday color to a delicious cookie. 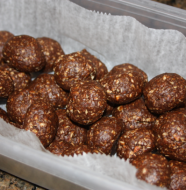 I also like that these can be made in advance and easily enjoyed as we anticipate Christmas. 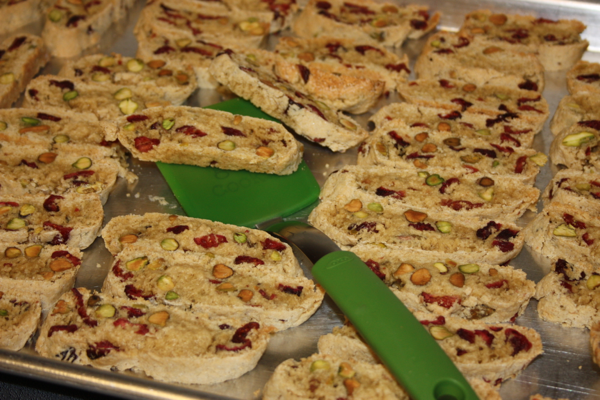 The addition of these biscotti would make an excellent gift to add with some holiday coffee or tea. Yum! Did you notice the fun green spatula in the picture? Oxo provided me with one of these cute spatulas for free to use, and they also provided me with an additional one to offer as a giveaway. 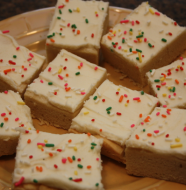 I really enjoyed using the spatula and am looking forward to using it even more as I continue my holiday cookie baking and I know you will as well. Although I love the size and flexibility of the spatula, the coolest thing about it is is helps fund pediatric cancer research. Two of OXO’s employees founded Cookies for Kids’ Cancer as they battled cancer with their child. They were shocked to learn that the main reason over 25% of kids diagnosed with cancer do not survive is because of the lack of effective therapies and the reason for the lack of effective therapies was the lack of funding. Cookies for Kid’s Cancer was born to fill this void and to provide inspiration and support for individuals, communities, and businesses to help fight pediatric cancer through the concept of local bake sales. So far OXO has helped raise over $150,000 to support Cookies for Kids’ Cancer. 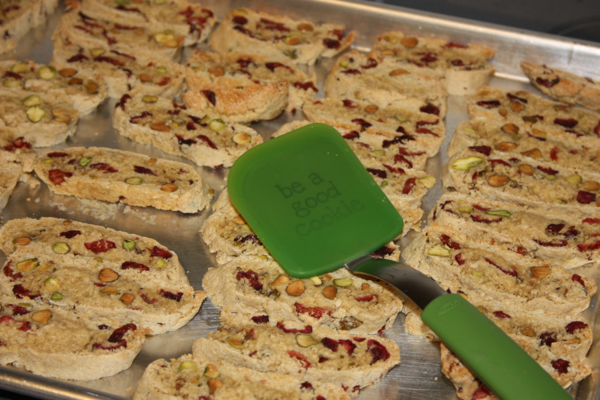 This fun “Be a Good Cookie Spatula” is another way that they are helping raise money. 50% of the profits from the sale of the Limited Edition Cookie Spatula helps support Cookies for Kids’ Cancer up to $100,000. If you would like to buy one for a stocking stuffer or gift, please visit www.amazon.com , Bed Bath & Beyond, or www.oxogoodcookies.com. You can also help with Cookies for Kids’ Cancer by visiting www.oxogoodcookies.com and sending Virtual Cookies to help spread the work or find out how to host a Bake Sale. 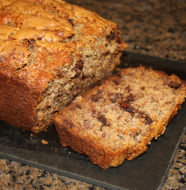 To enter my giveaway, leave a comment telling me what you are baking for the holidays. For an additional entry share on Facebook or Pintrest and leave an additional comment telling me you have shared my blog post. Entries will be accepted through Sunday, December 18th. The winner will be announced on Monday, December 19th. Preheat oven to 350 degrees. 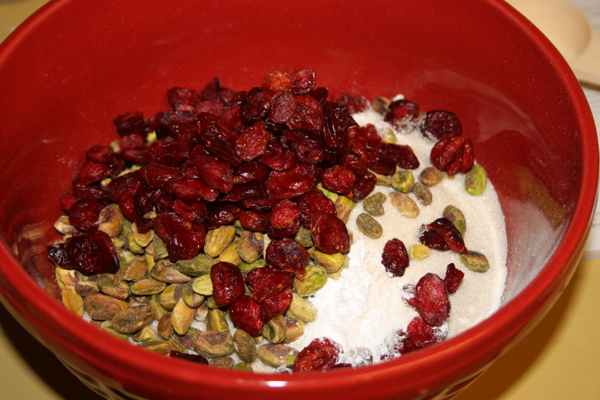 In a medium sized bowl, combine the flour, sugar, pistachios, dried cranberries, baking powder, and salt. In a small bowl whisk together the eggs and vanilla. Add the egg mixture to the flour mixture and stir with a wooden spoon. You want to mix until the dough is combined. (It will be very stiff so it may be easier to finish the dough using your hands.) Divide the dough in half. On a lightly floured surface, roll each dough half into a 12-inch log. Place the logs on a baking sheet and gently press them to about a ⅞-inch thickness. Bake until risen and firm, about 20 minutes. Cool completely on the baking sheet (about 30 minutes). Reduce the temperature in the oven to 300 degrees. On a cutting board slice the logs into ½- inch slices using a serrated knife. Place the slices on the baking sheet cut sides up. Bake until dry and starting to brown about 20 minutes. 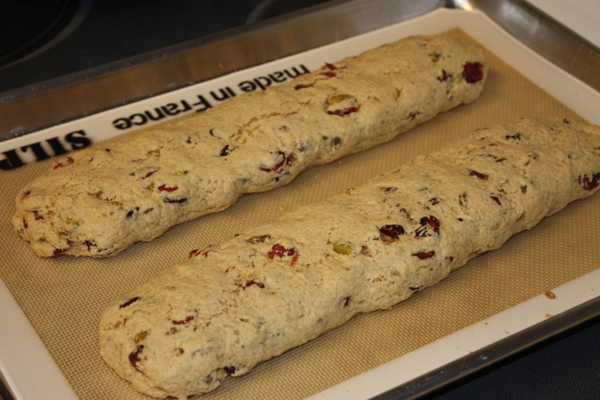 Transfer biscotti to a cooling rack and cool completely. Dry ingredients in the mixing bowl. 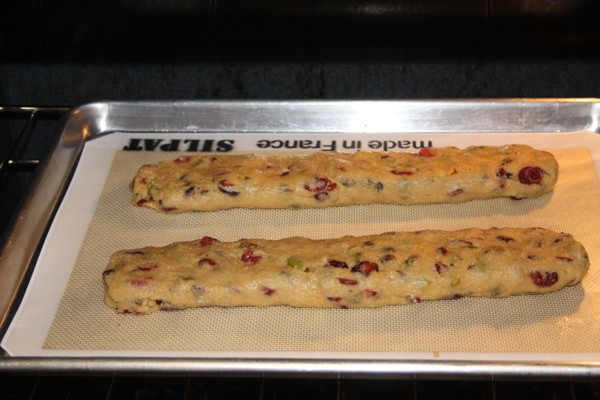 Biscotti logs in the oven. First baking of biscotti complete. Slicing the biscotti and getting it ready for the second baking. Biscotti after the second baking. 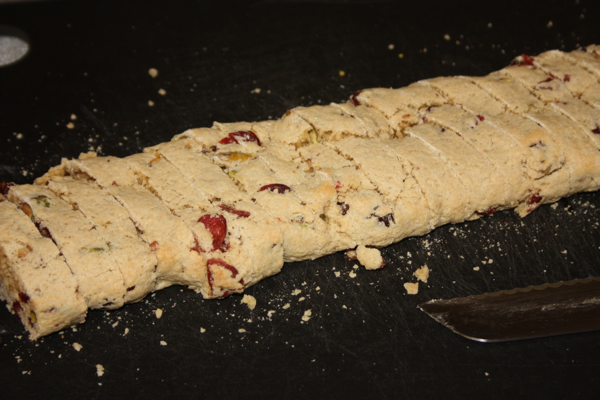 5 Comments on "Cranberry Pistachio Biscotti and a Giveaway"
These look amazing!! Your a genius!! Looks yummy! Great cause with spatula! those look fabulous Dinah! I might just have to try these! Enjoying Biscotti with my morning coffee. Ummmmmmmmmmmmmmmm!